I've been struggling a bit, but didn't really care too much about it because, you know, english. But I've come across a friend of mine who's got the same problem on Gentoo, and asked me for help.. and in turn I'm asking here to see if anyone knows a solution for this. First of all, UK international was working fine without any problems, until one day it suddenly decided to stop working after an upgrade. Even with this, combos e.g. AltGR+'+e is not outputting é, nor any other combination for any other international character, works. Well, in X /etc/conf.d/keymaps doesn't really matter. Consider that I've never configured the keyboard under X, and always let XFCE take care of it. [2679122.777] (**) Option "xkb_rules" "evdev"
[2679122.777] (**) Option "xkb_model" "pc104"
[2679122.777] (**) Option "xkb_layout" "us"
[2679122.777] (**) Apple Inc. Apple Keyboard: Applying InputClass "evdev keyboard catchall"
[2679122.777] (**) evdev: Apple Inc. Apple Keyboard: Device: "/dev/input/event4"
[2679122.777] (**) Option "config_info" "udev:/sys/devices/pci0000:00/0000:00:1a.0/usb1/1-1/1-1.3/1-1.3.2/1-1.3.2:1.1/input/input4/event4"
I don't use a Mac, but that keyboard layout you linked to is not a British Apple keyboard layout (see Differences between British and US Apple Keyboards). 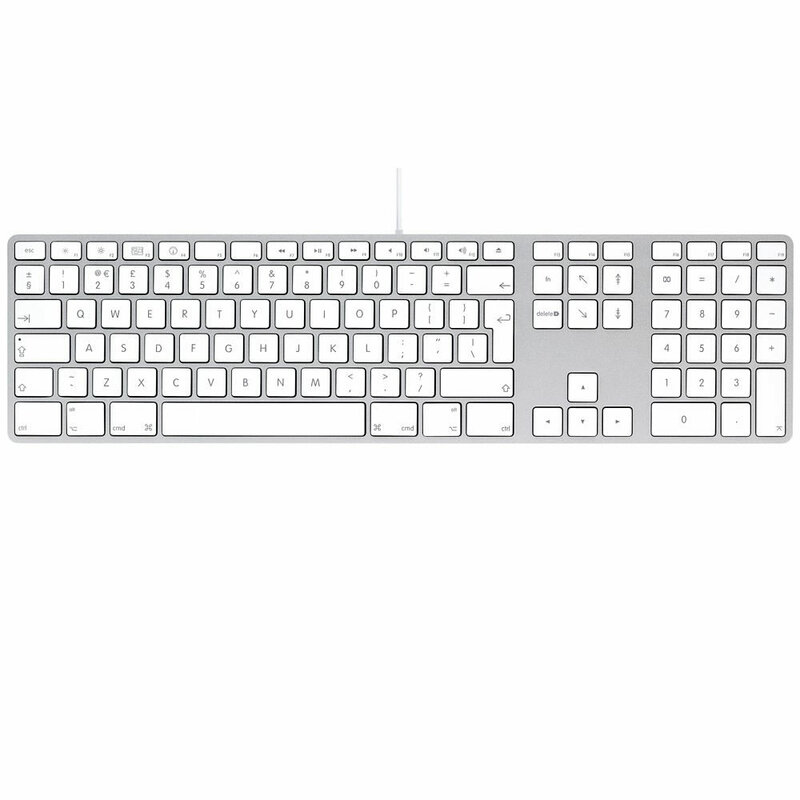 It looks to me to be a US Apple keyboard layout. Do you have xfce4-xkb-plugin installed, and do you normally select the keyboard layout using Keyboard Layouts in Xfce? Rather than selecting the keyboard layout via the GUI you could try doing it directly in xorg.conf if your keyboard device is already specified in that file, or in a separate file /etc/X11/xorg.conf.d/00-keyboard.conf if your keyboard device is not already specified in xorg.conf . You may already have a file *-keyboard.conf in /etc/X11/xorg.conf.d/ which you could edit accordingly. Option "XkbLayout" "applealu_iso" # Try "applealu_ansi" as well. I have specified the XkbOptions option to be "grp:alt_shift_toggle" so that I can use Alt+Shift to toggle between the keyboard layouts. The key combination options for toggling are also listed in /usr/share/X11/xkb/rules/xorg.lst. Option "XkbVariant" "intl" # Or maybe try "alt-intl". The different keyboard variants are also listed in /usr/share/X11/xkb/rules/xorg.lst. The allowable alternatives to 'lwin' (Left Windows key) are also listed in /usr/share/X11/xkb/rules/xorg.lst. Selecting different keyboard layouts in Xfce. I'll try to implement the solution given by Fitzcarraldo and report back. Now I´ve got the internationalisation keys working using the keyboard layout switcher of XFCE, but some keys are just awkward, as the double quotes gives me this symbol: ¨ and the §/± key is inverted with ~/` key.